QwikLugs are compressor terminal repair kits for all compressor brands, sizes and configurations used in industrial, HVAC/R, appliance, electrical, military and testing/monitoring applications. The kit, from Mainstream Engineering, is tightened onto spade-style compressor terminals with front-access Phillips head set screws. It also serves as a universal adapter for incompatible connections during compressor replacements. Five kits are available: 2-foot-long with 10-gauge wire; 4-foot-long with 10-gauge wire; 2-foot-long with 12-gauge wire; 4-foot-long in 12-gauge; or a wireless kit. 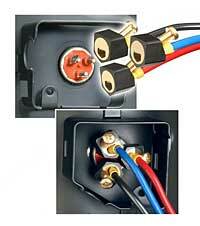 Constructed of an all-brass fitting, QuikLugs have a non-flammable, insulated Valox plastic outer-molding.